Last month, Burson Audio invited creative people from all around the world to participate in a static visual art competition. The competition ran between 12th May to the 12th June 2014. Participants needed to post at less one piece of static visual artwork that features Burson product/s and Sennheiser headphones on our Facebook app. Burson always encourage creativity among their participants, there was no restriction to the form of artwork (photo, photo with special effect, drawing, painting and etc…). 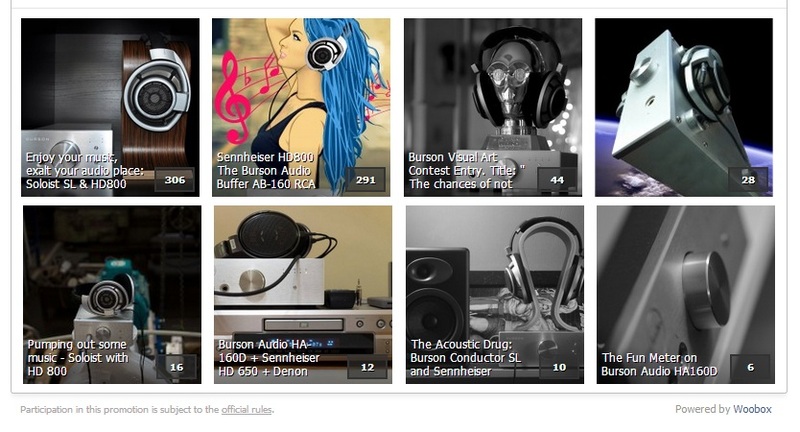 The participants also needed to state in their caption which of the Burson products/Headphone amps and Sennheiser headphones were featured in their artwork. The participant who receives the most votes for their artwork wins the competition. Winner can choose between $300 USD cash price (pay via Paypal) or a $500 USD store credit for any of the Burson products. The Winner, got 306 votes. The picture featured a Soloist SL headphone amp and Sennheiser HD800 headphones. 1) Contestants must be 18 years or older to participate. 2) Open to people from all countries, except where prohibited by laws and/or regulations. 3) Burson reserves the right to exclude contestants. Fraudulent activities will lead to exclusion. 4) Winner must have Paypal in order to receive the prize unless he/she chooses the store credit for any burson product. 5) By entering the Burson visual static art competition, you agree to consent to the use of your submitted photograph for use on the Burson audio website, publications and social media. Additionally, you consent to the use of photographs to promote future Burson audio events by the Marketing Dept and other media. 6) This contest is in no way sponsored or affiliated with Facebook.